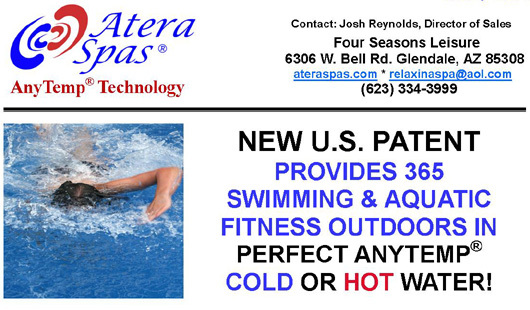 Atera AnyTemp® Spas introduces three NEW Fitness, Training and Swim Spas for 2012! Invented in AMERICA! Made in AMERICA! - Unlike Any Other Only Seasonal Swimming Pool, Swim Spa or Hot Tub Spa! Atera AnyTemp® Spas introduces three NEW Fitness, Training and Swim Spas for 2012! These portable home Swim and Exercise Spas provide exclusive daily outdoor health and wellness benefits as a warm pool and hot tub spa in the winter and a refreshing cool pool and cold plunge spa all summer, even in blistering heat and humidity. This remarkably energy efficient, self-contained Chiller and Heater System has a temperature range of 62°F to 104°F even in extreme outdoor temperatures. provides daily pain relief to those suffering with skeletal, joint or muscle pain from injuries and surgeries while increasing mobility. Symptoms of arthritis, fibromyalgia, diabetes, multiple sclerosis and many other maladies are typically reduced with perfect temperature COLD, COOL, TEPID, WARM OR HOT healing water 365 days a year in the privacy of your own home, indoors or outdoors. Atera’s Green Technology recycles milk jugs to craft beautiful Eco-Smart exterior cabinets with the industry’s first Lifetime Warranty. An exclusive energy efficient thermos bottle design provides 24 hour filtration while Atera’s Choice® All Natural Water Purifying System eliminates the need for toxic chlorine, bromine, ozone and other chemicals prolonging the life of all spa components, improving your health and conserving water! Unlike Any Other Only Seasonal Swimming Pool, Swim Spa & Hot Tub Spa! Please visit http://www.ateraspas.com for details and to request a Factory Direct Wholesale price quote. Atera also proudly offers additional discounts to those treating diseases, law enforcement, firefighters, military families, educators, medical professionals and seniors. For a full demonstration of the patented Atera AnyTemp Swim Spas®, AnyTemp® Exercise Spas and AnyTemp® Therapy Spas visit the Factor Direct Showroom at Four Seasons Leisure, 6306 W. Bell Road, Glendale, Arizona, 85308 or call (623) 334-3999. Thank you for allowing this INNOVATIVE AMERICAN company the opportunity to play a significant role in your future home fun, health and wellness plans.